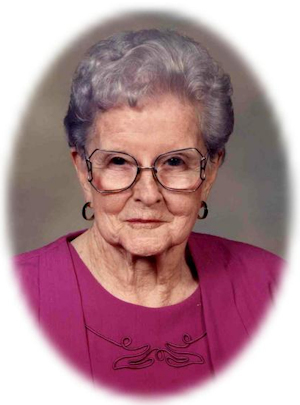 Obituary – Voigt, Helen Maxine (Huston) « Perry High School Alumni Association, Inc.
Helen Maxine Huston Voigt was born March 15, 1915 in Marland, Oklahoma, the daughter of Robert and Grace Krebs Huston. Her family moved to Perry when she was 4 years old. She attended Perry schools and lived in Perry most of her life. Following graduation from high school, she attended Oklahoma A M, now Oklahoma State University. Helen and Emil Voigt, a Perry native, were married September 1, 1934 in Ponca City, Oklahoma. She was employed by the Federal Crop Insurance from 1961 until she retired in 1983. After retirement, she returned to work as secretary for her church, the First United Methodist Church of Perry. On January 30, 1986, her husband Emil Voigt died. Helen was an active member of the Perry community. She served as president of the Perry Parent-Teacher Association, past president of the Senior Home Culture Club and the Petunia Unit of Perry Garden Clubs; past Mother Advisor of the Order of Rainbow for Girls and served as Mother Advisor of the Perry Assembly 52 for 12 years. Helen was also active in the Perry Amaranth and White Shrine in Stillwater, past worthy matron of the Perry Chapter 94 Order of the Eastern Star and served two years as a district deputy of the Oklahoma Grand Chapter of OES. She was a member of the First United Methodist Church of Perry, where she taught Sunday school for many years. She was a member of the Perry Golf and Country Club and enjoyed playing bridge. Funeral services will be 11:00 a.m. Wednesday, August 8, 2007 at the First United Methodist Church in Perry. Rev. Ed Cook will officiate, assisted by Rev. Jim Voigt, Jr. Interment will be in Grace Hill Cemetery. Services are under the direction of Brown-Dugger Funeral Home in Perry. There will be a family visitation from 6:00 to 8:00 p.m. on Tuesday, August 7, 2007 at Brown-Dugger Funeral Home. Memorials may be made to the First United Methodist Church in care of Brown-Dugger Funeral Home, 1010 N. 7th Street, Perry, Oklahoma 73077. Helen is survived by two sons, Robert Voigt and his wife, Ligia, of Owasso and Jim Voigt and his wife, Barbara, of St. Joseph Missouri; one granddaughter, Emily Voigt of Dallas, Texas; four grandsons, Mike Voigt and his wife, Lisa, of the Woodlands, Texas, Jim Voigt and his wife, Kim, of Springfield, Missouri, Brad Voigt and his wife, Melissa, of Kansas City, Missouri and Nathan Voigt of St. Joseph, Missouri; five great-grandchildren; one sister, Ruth VanArsdel of Memphis, Tennessee and one niece, Simone Belk and her husband, Larry, of Memphis, Tennessee.